If you camp, backpack, hike, or hunt, you know you need this. If you have to grab lunch between classes, you know you need this. If you eat lunch at your desk, you really know you need this. Of course, the Kershaw Ration spoon-and-fork tool is compact. 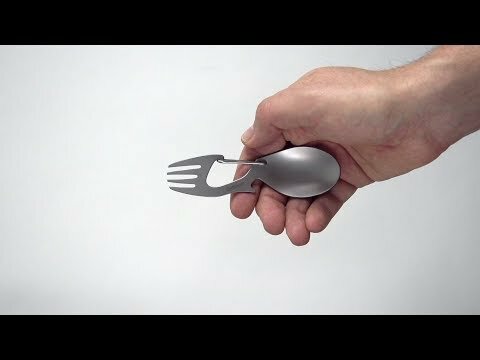 But it’s a compact tool that also offers a generously sized spoon—so you can get a real mouthful of that soup or chili you’re eating—as well as a fork with tines long enough to actually be useful. Overall Length: 4.625″. Weight: 1.1 oz. Features: Fork, Spoon, Bottle Opener, and Carabiner Gate.